(b) Using a center punch, mark the center of the tapered-head bolt. (c) Using a 3 to 4 mm (0.118 to 0.157 in.) diameter drill bit, drill a hole in the tapered-head bolt. 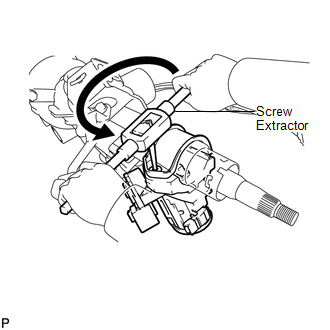 (d) Using a screw extractor, remove the tapered-head bolt, and then remove the steering lock actuator assembly from the steering column assembly. 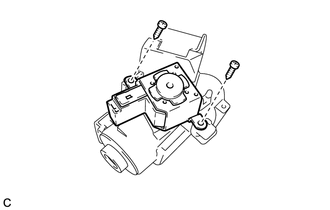 (d) Using a screw extractor, remove the tapered-head bolt, and then remove the steering column upper with switch bracket assembly from the steering column assembly. 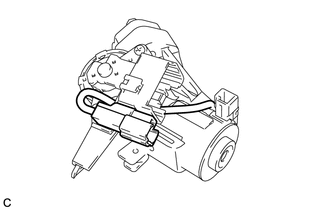 (a) Remove the solenoid wire connector from the ignition or starter switch assembly. 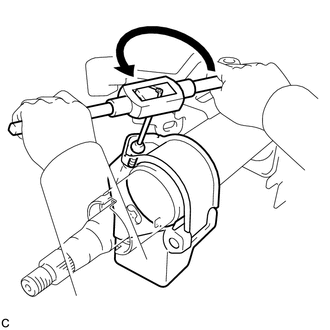 (b) Remove the 2 screws and the ignition or starter switch assembly from the steering column upper bracket. (a) Remove the 2 screws and the key interlock solenoid from the steering column upper bracket. (b) Disconnect the solenoid wire connector from the key interlock solenoid. 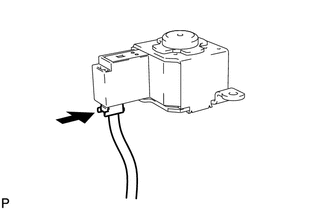 (a) Remove the solenoid wire from the steering column upper bracket. 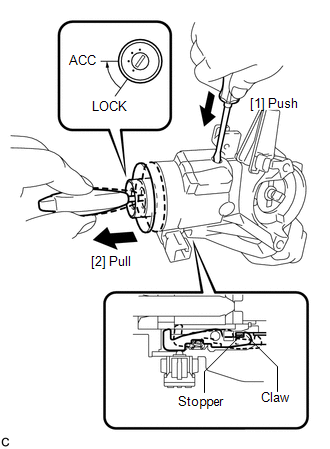 (a) Turn the ignition switch lock cylinder assembly to the ACC position. 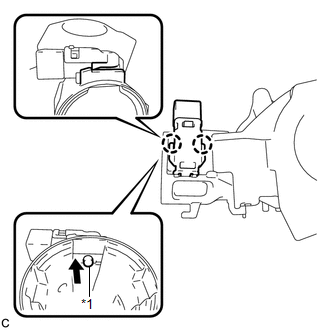 (b) Insert a screwdriver into the hole of the steering column upper with switch bracket assembly as shown in the illustration. 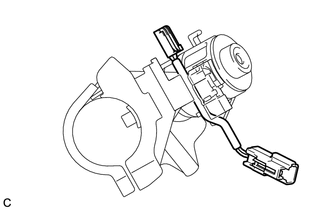 Pull the ignition switch lock cylinder assembly until its claw contacts the stopper of the steering column upper with switch bracket assembly. 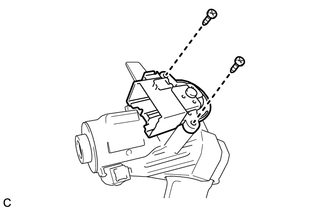 Make sure to pull the ignition switch lock cylinder assembly until its claw contacts the stopper of the steering column upper with switch bracket assembly. Failure to do so will affect later work operations. (c) Insert a screwdriver into the hole of the steering column upper with switch bracket assembly. 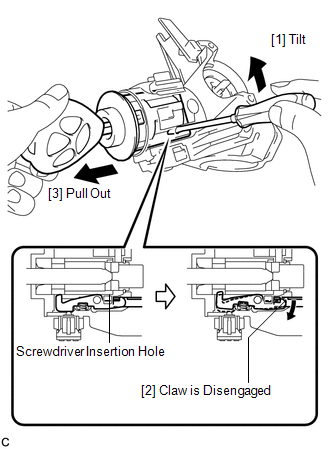 Tilt the screwdriver as shown in the illustration to disengage the claw of the ignition switch lock cylinder assembly, and pull out the ignition switch lock cylinder assembly. (a) Remove the unlock warning switch assembly by pushing up the center part and releasing the 2 claws.